A bird‘s feathers have various functions. Its body feathers regulate the body heat, while the wing and tail feathers are needed in flight and to guide flight. The bird‘s appearance and attraction are determined by its plumage, which can also protect it from enemies through plain colouring, or, of course, birds who have little or no mating call have a distinctive and decorative feather dress to attract mates and avoid interbreeding among different types. Whether in respect to a nestling‘s first set of feathers or a new set for a moulting bird, this is a highly complicated process which puts a great strain on the bird‘s entire organism. And as feathers make up 5% of the bird‘s whole weight and are largely protein in nature it is very important for the bird to get a well-balanced diet rich in protein and supplemented by vitamins and minerals when a new set of feathers is growing in. The majority of feather defects in cage birds are due to incorrect feeding. An incorrect diet is often the reason, too, that birds die during the moult, and not because of moulting disorders as many owners claim, but due to a lack of protein and/or vitamins, macro and trace elements. A bird reduces the protein contained in the food into its different components (amino acids) and uses them to produce its own protein. It is therefore particularly important to give a bird an exact and well-balanced diet of all the indispensable and limiting amino acids to enable it to produce sufficient protein of its own. Most cage or aviary birds are fed on bird seed and vegetable matter, which are not always in a position to cover a bird‘s protein requirements because of their unfavourable amino acid composition. This means that in stress situations such as during the moult, parasitic infestations, infections, etc., problems in the metabolic processes and feather growth arise and result in death in some cases. This poor amino acid composition has been taken into account in the development of NEKTON-BIO. NEKTON-BIO contains not only 18 different free amino acids in the correct relationship, but all those vitamins necessary for feather growth as well as a great variety of minerals, for these substances are also particularly important for the smooth functioning of all metabolic processes and therefore promote feather growth. Vitamin A, vitamin D3, vitamin E, vitamin B1, vitamin B2, D-pantothenic acid, niacinamide, vitamin B6, folic acid, vitamin B12, vitamin C, vitamin K3, biotin. DL-Methionine / L-lysine /L-arginine / L-alanine / L-aspartic acid /L-cystine / L-glutamine / L-glycine/glycol /L-histidine / L-isoleucine / L-leucine /L-phenylalanine / L-proline / L-serine /L-threonine / L-tryptophan / L-tyrosine /L-valine. Calcium / zinc / manganese / copper / iron / cobalt / iodine / magnesium. 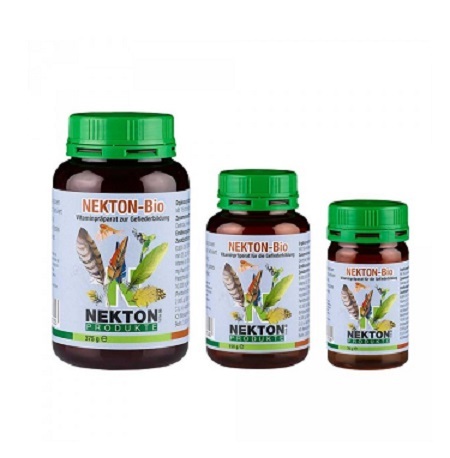 Being in powder form and soluble in cold water, NEKTON-BIO can be added to the bird‘s soft food or drinking water without any trouble whatsoever. Use NEKTON-BIO in the given dosage during the moult for the best effect. NEKTON-BIO is an amino-acid-enriched vitamin supplement to prevent plumage defects and ensure good feather growth. NEKTON-BIO gives birds smooth, shiny plumage. NEKTON-BIO strengthens and supports a bird during the strain of the moult.